In the past year I have easily traveled to 10 different states and I couldn’t be happier traveling! I have been to Georgia, Alabama, Louisiana, South Carolina, North Carolina, Tennessee, Virginia, West Virgina, New Jersey, Maryland, Pennsylvania, and of course, Florida. Traveling is great and very educational. Each state has its own personality and culture, I just love it! I will probably blog from time to time about different adventures from my vacations and keep y’all in the loop. So for this blog I will focus on Asheville, North Carolina. I went to Asheville about a month ago and gosh I went at the perfect time too. The leaves were just beautiful and nature was calling out to me for peace and serenity. I loved the locals of Asheville as they were all very nice and friendly. I enjoyed all the farmers markets and vegetarian/vegan restaurants too. At some of the farmers markets I struck up conversations with several of the vendors who explained their farms were about thirty minutes out of Asheville. How cool is that?! There was a strong artsy feel to the area as well and I enjoyed my travels to their Downtown Asheville Art District. Numerous local artists with little studios to show off their beautiful work. I was taken away by the earthy and artsy culture of the city. The only negative was driving in the mountains. As a Floridian, I don’t know too much about mountain driving so the mountains were a bit of a challenge. I had to parallel park on the mountain, what a nice little challenge that was for me in my manual car! Don’t get me wrong though, the mountains were so breathtaking, but driving through the mountains was a bit of a challenge for us Florida folk! During my travels to Asheville I stopped at 2 different fabric stores, but I wanted to discuss one of them today. The fabric store was called Asheville Cotton Co. and boy oh boy what a pleasant shopping experience I had there! The staff was super nice and very helpful. They even recommended other local fabric stores to check out as each store is different. I really appreciated their recommendations as a tourist who wanted to check out any fabric store possible! The store itself was a nice size, probably the biggest fabric store I have been in to date, or at least it seemed that way to me. I didn’t ask for square footage or anything so I couldn’t tell ya for sure! They had several huge tables with clearance fabrics marked at different discount amounts. Asheville Cotton Co. had organic fabrics too, which was a nice surprise because most stores do not carry organic fabric. This little fact was a nice bonus for me as many of the items in my shop are made of organic fabrics. The store’s website brags about their vast amount of fabric bolts, over 8,000! Man, what fabric lover would not want to check out this fabric shop?! This allowed the store to have the whole line of fabric instead of certain pieces from a particular line. Yet another added bonus for me as I got to see and feel the fabrics in person. I was really stoked to see the complete line of fabrics in person since the closest thing I had to this was online shopping. There are not many fabric stores in South Florida and thanks to a few phone calls, none of them had organic fabric either. While I was there the plaza was under construction, but the shop was still open for business. In the same shopping plaza as this amazing fabric store was a neat ceramic shop! Can you say, all day affair?! Between doing ceramics and buying fabric, an artist could definitely fill up their day quite easily. There were also places to eat in the plaza and even a Starbucks. One could definitely have a nice outing by visiting this particular shopping plaza! So back to the Asheville Cotton Co….!…. they had beautiful quilts decorated throughout the shop, which is always fun to admire. There was a nice selection of sewing machines in the whole front half of the store as well. There were also one or two customers I observed getting their sewing machines fixed. Again, the staff was very helpful from what I could see and tried to fix the machine while the customer was standing there. One of my favorite fabrics I saw in the store was a comic strip fabric called Quilt Girl. What a unique idea and I can see many people purchasing this pop art inspired fabric. I left the store with a small purchase of only about 2.5 yards of fabric because it was my first destination stop on my road trip. I had to display self-control in fabric purchases, right?! 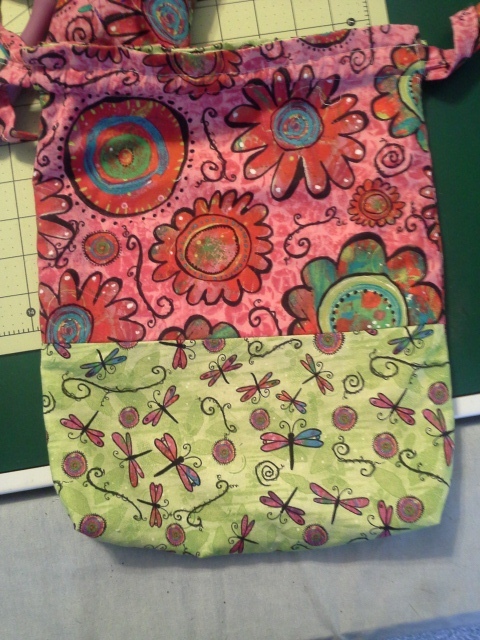 I ended up gifting about half the fabric to my mom who made super cute bags with the cotton. 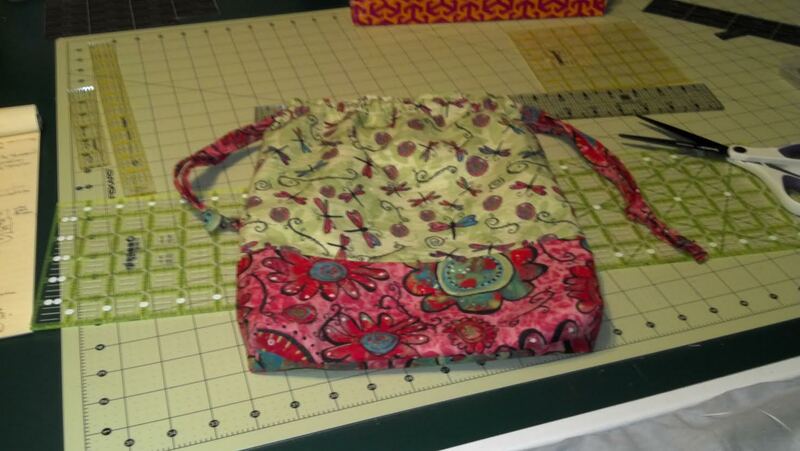 Buying fabric for a quilter or seamstress is the ideal souvenir! So if you’re ever in Asheville, it is absolutely worth your time and dime to visit, Ashveville Cotton Co.. 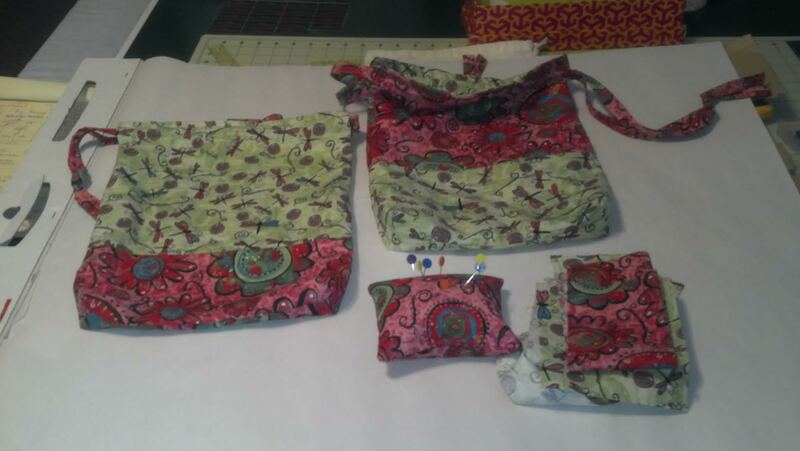 These are the fabrics I purchased from Asheville Cotton Co. and the bags and *pin cushion* my mom made!